The Blood Moons And The Shemitah: These Two Events Are On A Collision Course And They Could Have Prophetic Implications! SCROLL DOWN FOR NEWS LINKS AND VIDEOS: Who would have thought that Mark Biltz discovery about the Blood Moons and The Shemitah that Jonathan Cahn wrote about in “The Harbinger” would be on a collision course. They bear a strong and timely connection. My mind is racing as I ponder the significance of these two events. Educate yourself with the Bible. Catch-up on your reading and understand the times we are living in. Do what you need to do to get caught up in these exciting times we live in. We are about two witness two events in the course of the same year and they are a collision course with Israel and the whole world. Remember the Blood Moons isn’t so much about the end of the world. It deals with signs of the times and they are significant in Israel’s history. We are watching things accelerate in the world as it steps into the crossfire of these events. The heavenly skies are revealing signs in the sky as God speaks through them so the inhabitants of this Earth would listen. “And I will shew wonders in the heavens and in the earth, blood, and fire, and pillars of smoke. The sun shall be turned into darkness, and the moon into blood, before the great and the terrible day of the LORD come” Joel 2:30-31. God is speaking to you at this hour. Would you heed his call and listen to what he is trying to say to you these exciting times? CHARISMA NEWS: Israel is appropriating $29 million to help farmers observe a critical agricultural commandment from the Mosaic law, according to WND. That commandment instructs the Israelites to give the land a rest from all agricultural activity once every seven years. In the Torah, the Sabbath concept isn’t limited to the seventh day of the week; it also applies to every seventh year—also known as the Shemitah year. The $29 million in funding is headed to Israel’s Religious Affairs Ministry, which will spend the money encouraging and enabling Jewish farmers who wish to follow the command. WND.COM: The authors of two of the most sensational prophetic books in recent years will be getting together this weekend for a joint appearance at the largest messianic congregation in the nation. And, why not? It makes perfect sense, because the messages of “The Harbinger,” the best-selling Christian book of the last three years, and “Blood Moons,” which took the world by storm this spring, bear a strong and timely connection. BLOOD MOONS THIS WEEK 4-15-2014: Four Blood Moons Are Sign Of ‘World-Shaking Event, ‘Blood Moons’ A Special Message To America, Israel To Miss Blood Moons, And Blood Moon Event This Tuesday? SCROLL DOWN FOR NEWS LINKS AND VIDEOS: We are one day away from the Blood Moon event. What an exciting time as talk of these Signs in the Heaven has the whole Christian world excited and scared. What do these Blood Moon events mean for the world? Is this a sign for America? Israel is not even in the path of the Blood Moons and will miss it entirely! A pattern is being formed as God is profiling an event for the world. I honestly feel we are experiencing signs and God is warning the world of impending judgment. These are signs to warn you he will be coming very soon. I am not saying that God is coming during the Blood Moon events of this year and next year. I am telling you he is sending signs for the world to witness. This is a sign to bring your bible out and study the word of God so that you are not left in darkness. We could truly be entering prophetic times as the world seems to be tittering on the brink of collapse. One of the Four Blood Moons is here and time will only tell if it has any meaning for the world. Thank you for visiting These Christian Times and God Bless you. Mark Biltz Prophecy In The News Interview. The Man Who Discovered The Blood Moons. NYDAILY NEWS: The heavens are putting on a celestial show next week — and one Christian pastor is convinced it’s a sign from God. The blood moons are part of a tetrad, a set of complete and consecutive lunar eclipses that will begin on April 15 and continue in roughly six-month intervals until October 2015. According to NASA, seeing four complete lunar eclipses in a row is very rare. The skies were tetrad-free from 1600 to 1900. But in the 21st century, there will be many. ‘Blood Moons’ A Special Message To America? WND.COM: While most of the U.S. is asleep Monday night, an astronomical phenomenon some mark as a sign of God’s judgment will blaze uniquely across the skies of North America. The first of four, consecutive, total lunar eclipses, which cause a roughly hour-long reddening of the moon known as a “Blood Moon,” will become visible beginning at 12:53 a.m. ET on Tuesday, April 15. Tuesday’s blood moon is part of a “tetrad,” a set of complete and consecutive lunar eclipses that will continue in roughly six-month intervals until October 2015. ISRAEL TODAY: The scheduled appearance of four total lunar eclipses on major Jewish holidays between this Monday night (the start of Passover 2014) and September 27, 2015 (the start of Sukkot) has the attention of much of the Christian world. But the eclipses are going to go almost totally unseen in Israel. Data published by NASA reveals that all but the last of the four eclipses will not be visible from the Middle East, and even the fourth will only be partially visible. MYFOXNY.COM: Everyone get ready, an eclipse will be visible for the tri-state area on Tuesday. 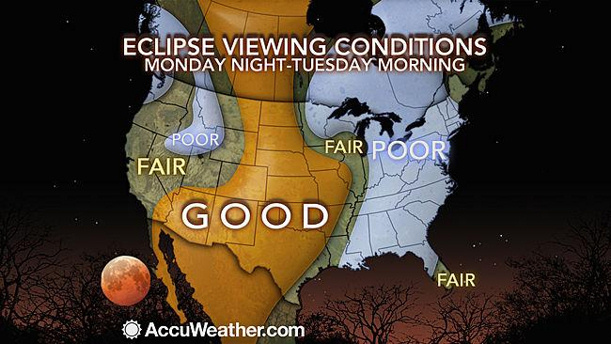 It will start early Tuesday morning, the first of four such lunar eclipses over the next year and a half. The blood moon will appear during what is the first total lunar eclipse in two years. A lunar eclipse happens when a full moon aligns with the sun and Earth. The Earth’s shadow is cast across the moon, blocking the rays from the sun. The moon turns red during this type of eclipse because the sunlight is refracted, similar to the way it is bent during a sunset. The Blood Moons Are Coming: Blood Moon This Month Sparks Apocalypse Woes: Bible Scripture Cites World End, Total Lunar Eclipse Expected April 15, Blood Moon Eclipse On April 15 Is A Special Event, And The Man Who Discovered The Blood Moons (VIDEO). SCROLL DOWN FOR NEWS AND VIDEO: Blood Moon mania is reaching a fever pitch, as people try to understand the meaning of this awesome phenomenon. What is amazing is that these Blood Moons fall on Jewish Festivals. Is God marking dates with signs? What do these heavenly signs signify? The main stream media is finally reporting this amazing event. Of course the secular media’s ignorance and misunderstanding of these events have confused people into believing Jesus Christ may come on that day. These Blood Moons are nothing more than signs in the heavens that are pointing a warning to this spiritless world. Luke 21:25: “There will be signs in sun and moon and stars, and on the earth dismay among nations, in perplexity at the roaring of the sea and the waves. Not too long ago I wrote an article about the Polaris Star getting brighter. I felt it to be a sign just like the Blood Moons that we should take notice. If you haven’t read it, than I highly advise you that you take the time to do it. Why is the Polaris Star getting Brighter: https://joecruzmn.wordpress.com/2014/02/06/polaris-the-north-star-is-getting-brighter-and-no-one-knows-why-could-polaris-be-a-sign-of-the-coming-rapture-or-the-return-of-jesus-christ/ These are signs letting a lawless world know that the birth pangs of Jesus Christ return is beginning. It does not mean he will return on April 15th, 2014. God is telling you time is running out and he is going to gather his chicken’s home. If you want to know what these signs mean then please open your Bible to grasp Gods understanding of what is happening. If you do, than you can truly understand the sign and wonders and the Birth Pangs of the Second Coming of Christ that are beginning now! Thank you for Visiting These Christian Times and God Bless You. AN AMAZING DISCOVERY OF ASTRONOMICAL IMPORTANCE! THIS INTERVIEW STARTED IT ALL. THE EXAMINER: When the blood moon appears this month it may strike you as looking wounded. The blood moon will be drenched in a deep red hue, almost resembling the color of blood. This event has a significant link to the apocalypse that was deciphered from a bible scripture, according to some religious leaders. INQUISITR.COM: A blood moon is expected during a total lunar eclipse on April 15. The eclipse will begin at approximately 3:07 am EST, with full coverage occurring at around 3:36 am EST. The entire eclipse will last just over an hour. As the sun’s rays reflect off the Earth’s atmosphere, the moon is expected appear deep orange or “blood-red” in color. A TIME OF JACOBS TROUBLE? USA TODAY: Sky watchers are getting ready for an evening of special viewing when a total lunar eclipse arrives just after midnight on April 15. What’s more, this begins a rare sequence of four total lunar eclipses expected over the next two years. Some Christians see this series of so-called blood moons as linked to a biblical prophecy of the End Times. Blood Moons: Lunar & Solar Eclipse of 2014-2015 And A Creepy Children’s Book About Satanic Ritual. SCROLL DOWN FOR NEWS LINKS AND VIDEOS: The excitement over the upcoming Blood Moon is reaching a fever pitch. People can hardly contain themselves when you hear them talking about this heavenly event that is about to manifest on the moon. Some Christian believers view this as a sign of Jesus Christ Return, while others believe that there is no basis for this common event of eclipse and blood moons that have occur in the past. This is truly exciting and frightening times. There are too many events happening in the world that makes the Christian believer feel something does not feel right with the planet. Please read a great article published in May of 2008 concerning these events. The rise of demonic activity is in full swing as more and more people speak of demons manifesting themselves in their lives. 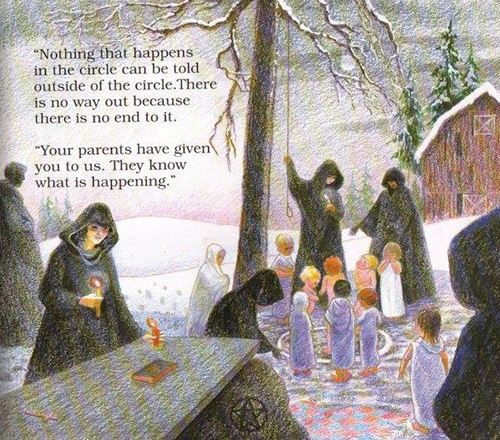 A book written by Doris Sanford titled, “Don’t make me go back mommy”, has an illustration and creepy images of Satanic Ritual Abuse. The book published in the 1990 was specifically marketed to mental health professionals, school counselors, parent organizations, and support groups. Read the article to see the creepy book and its content. Thank you for visiting These Christian Times and God Bless You.